As part of the POPSUGAR Insights Content, Commerce, and Culture study, we surveyed over 1,500 women between the ages of 18-44 and asked them to share their personal perspective on popular trends. From this, we learned that 62% of women consider themselves influenced by trends rather than being trendsetters themselves, and that given the choice, 76% of women would prefer to follow a trend than start one themselves. Additionally, 59% of women shared that participating in popular trends makes them feel happy, meaning that connecting with trends really can power a woman's happy. When we asked women to tell us more about where they first learned about the trends they actively participated in within the last year, 29% of women said they first discovered the trend on a social platform, 16% of women said they learned about it from their friends or family, 8% said they learned about it from TV, and 7% said that they learned about it from digital content. 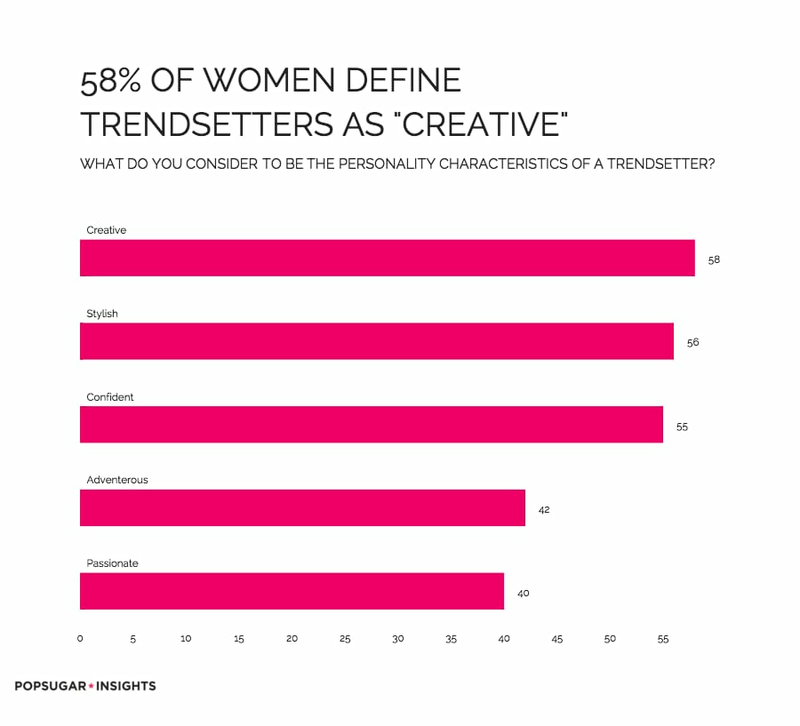 When we asked women to describe the personality characteristics of a trendsetter, they describe them as being creative (58%), stylish (56%), confident (55%), adventurous (42%), and passionate (40%).